A pretty, large pink rose dominates this pristine white set of bone china cups and saucers by Roy Kirkham. Dishwasher and microwave oven safe. A pretty, large pink rose dominates this pristine white set of bone china cups and saucers by Roy Kirkham. 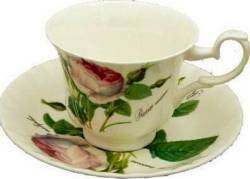 Lots of little rose buds and leaves makes this a lovely addition to any tea table rather formal or informal. Dishwasher and microwave oven safe.